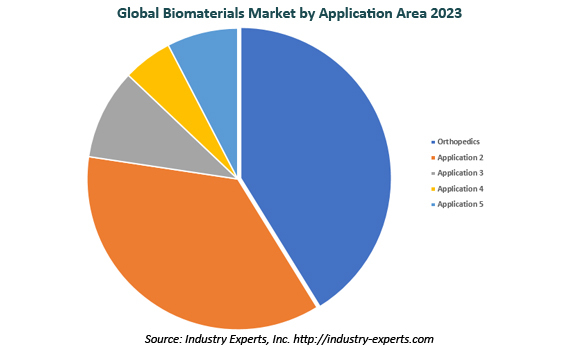 Industry Experts, Inc. published an updated 2018 version of the global market report on Biomaterials. The new report entitled “Biomaterials – A Global Market Overview” reveals that North America leads the worldwide market for Biomaterials, estimated at US$35.7 billion (42.7% share) in 2017, which is slated to post a CAGR of 14.1% between 2017 and 2023. Biomaterials constitute artificially derived synthetic or natural materials utilized in medical technology for enhancing the functionality of tissues and organs that are damaged. These materials function by interacting with biological systems in treating a number of conditions pertaining to cardiovascular, dental, orthopedic and neurological systems. The science of Biomaterials also finds application in a host of advanced medical technologies, such as tissue engineering, plastic surgery, drug delivery devices, and other medical implants. The global market for Biomaterial types analyzed in this study include Metal Biomaterials, Polymer Biomaterials, Ceramic Biomaterials and Other Biomaterials, for the period from 2015 to 2023. The report also includes the market analysis for Biomaterials applications comprising Orthopedic, Cardiology, Ophthalmic, Plastic Surgery and Other. Metal Biomaterials is estimated the largest of material types accounted for US$33.7 billion in 2017 and is projected to reach US$77 billion by 2023 at a CAGR of 14.7% between 2017 and 2023. However, demand for Polymer based Biomaterials is likely to record the fastest similar period CAGR of 17%. In terms of consumption Plastic Surgery application is primed to post the fastest similar period CAGR of 22.3% and reach a projected US$10.5 billion by 2023. Biomaterials global market is segmented into four major regions namely, North America, Europe, Asia-Pacific and Rest of World. The regional markets further analyzed for 12 independent countries across North America – The United States, Canada and Mexico; Europe – Germany, The United Kingdom, France and Spain; Asia-Pacific – Japan, China, India and Australia. The study analyzes the materials market in the above regions by major country, key application and by material type. This 386 page global biomaterials market report includes 192 charts (includes a data table and graphical representation for each chart), supported with meaningful and easy to understand graphical presentation, of market numbers. The report profiles 33 key global players and 57 major players across North America – 34; Europe – 19; Asia-Pacific – 2; and Rest of World – 2. The study also provides the listing of the companies engaged in manufacturing and supply of biomaterials and end-users. The global list of companies covers the address, contact numbers and the website addresses of 225 companies.